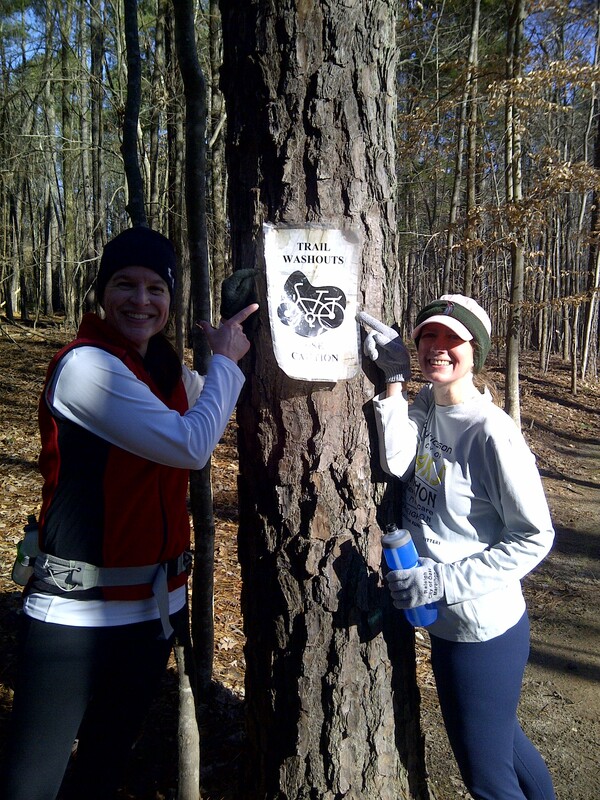 I gave full disclosure to my running buddies that I have yet to run through Umstead State Park without getting LOST a.k.a temporarily misplaced. So why would this run be any different? 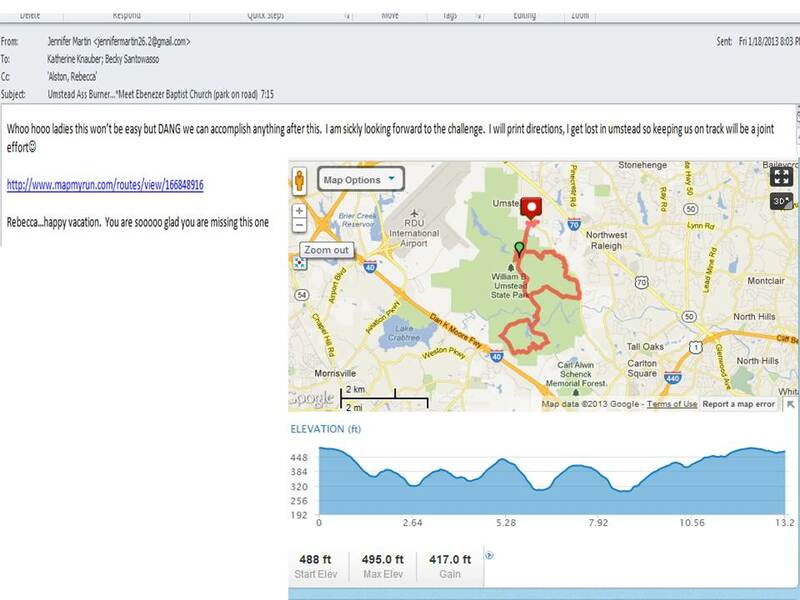 I carefully planned out our 13 mile route, via mapmyrun.com, all within the beautiful 5,579 acre park (it is so hard to believe it is nestled between Raleigh and Cary). I emailed the ladies the plan and gave them full warning of what we were getting ourselves into. In an effort to break my temporarily misplaced streak, I jotted down the names of the trail heads, turns etc onto an index card. I sealed the index card into a “snack bag” to keep it dry. We were not going get lost! YES, I could have used the mapmyrun.com app for my smartphone. Call me old school, I am kind of partial to my index cards. It was a crisp morning with temperatures hovering in the low 30’s. Great running weather. We were off! Caught up in jibber jabber we missed the first trail head. Ooops not off to a good start. Only 3/10 of a mile off course we circled back and jumped onto Lobllolly single track trail. It was awesome. Becky, our clumsy running friend, inquired if we would have to cross any streams. I quickly respond No 🙂 Wrong, we crossed two streams and all remained dry! The trail was beautiful and we all stayed upright. This was a major accomplishment given Becky’s tripping history on flat roads, and the frost covered wooden bridges. We were loving it. We transitioned to Company Mill trail which was just as wonderful. 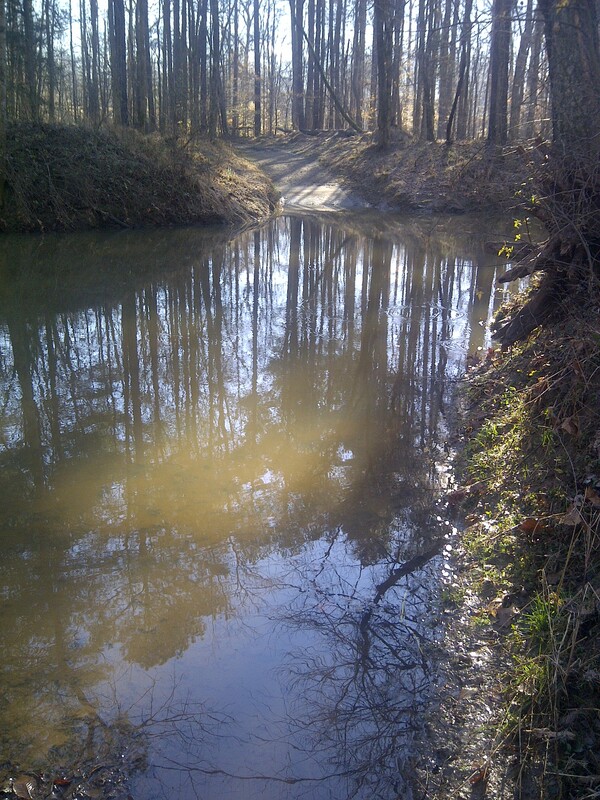 Why have I never run these trails that are practically in my backyard. We were in our groove taking in serenity of the trail and were “on track” or “on trail” of where we needed to be. After a VERY long down hill, 10 miles in, we hit our first unplanned obstacle. The trail was completely covered with water. We were perplexed, dumbfounded, and in utter disbelief. We just laughed wondering how this happened. This was not just a little high water this was a freak-in river. If it was the middle of summer perhaps we would have sloshed through but it was hovering around freezing. Knowing we just came down a VERY long downhill we pondered our options. 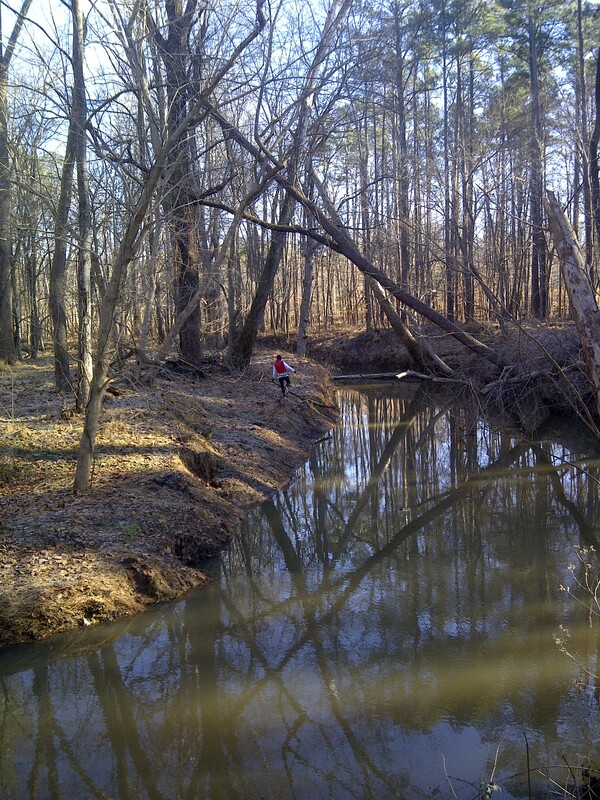 Determined, to cross the creek/river Katherine spotted a crossing via two fallen trees. Katherine, crossed the slippery moss covered tree to the opposing bank and went to investigate the second crossing. Upon inspection, what we thought was a second tree crossing was just a “forest mirage” that upon a closer look was just river sludge that looked like a log. 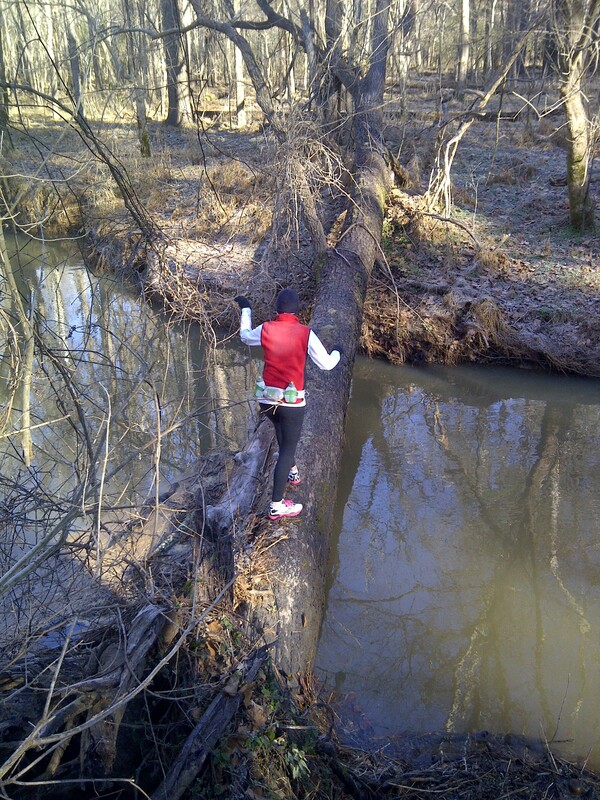 She successfully trans-versed the slippery log back to where Becky and I were watching in amazement. Katherine is “BADASS”, and she has the nerve to call ME crazy! With Katherine safely back, there was only one way out…up the VERY long hill! At the top of the hill, we spotted, a little too late, the trail washout sign. Duh! 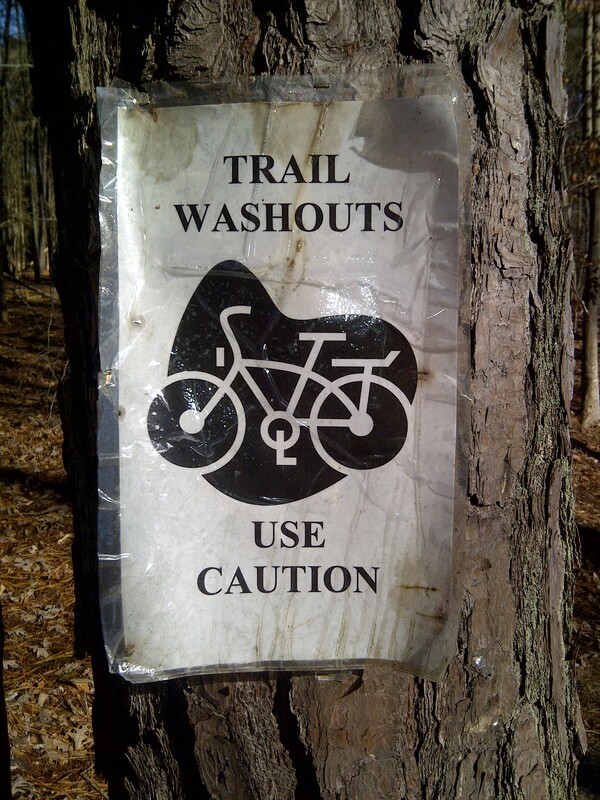 Duh!..spotted a little too late.Trail wash out warning sign! We laughed at ourselves! What else can you do? What an adventure! I could hardly contain my giggles. We were having so much fun. 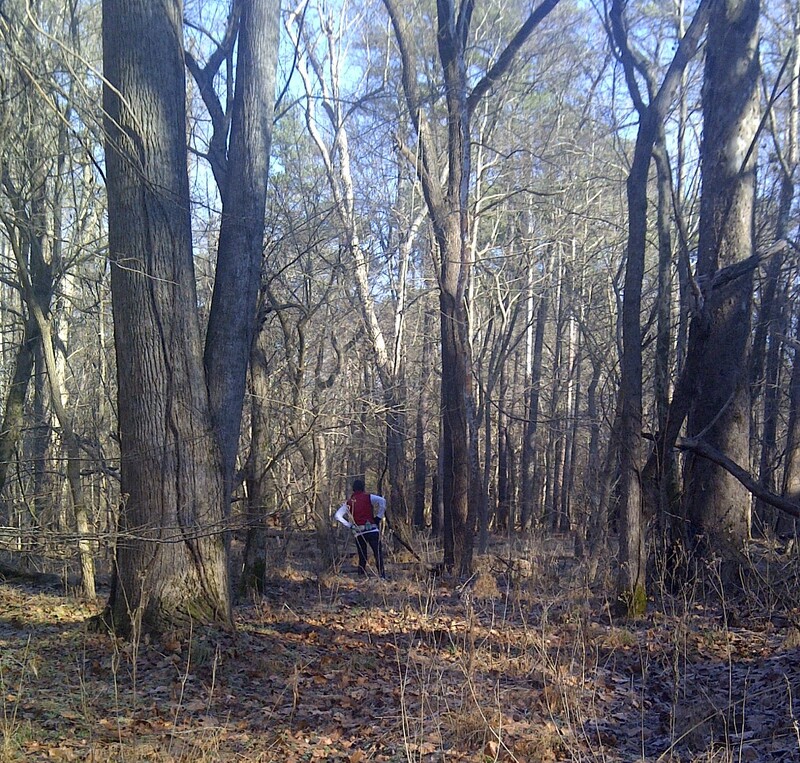 Surprisingly, without a trail guide/map,but some input from a few friendly runners we found our way back to our cars! Our planned 13 miles turned into 14.25 miles! Not too bad! Great adventure girls! I can hardly wait for our next adventure! 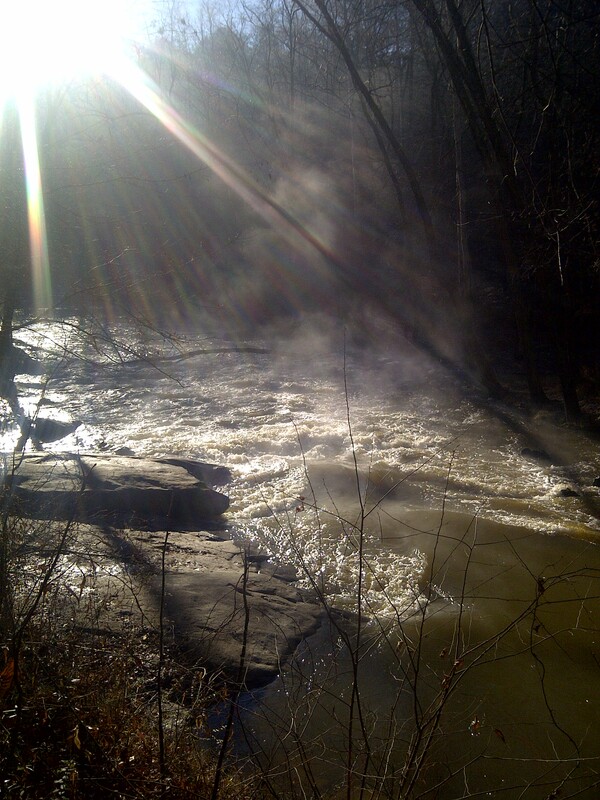 This entry was posted in Marathon Training, Running, Trail Running, Womens Running and tagged company mill trail, marathon training, mother runner, trail running, umstead, womens running by BoxerRunner100. Bookmark the permalink. What an amazing adventure outing yesterday and man am I feeling it today! Thanks, ladies for helping open my eyes to running for fun and letting go of the stress inducing intensity. Can’t wait for our next misadventure! I came over here from the RLAM FB page. Love your trail misadventure. It looks so beautiful that I’d be happy getting lost in there! Thanks for visiting and reading. I love our Another Mother Runner crew!